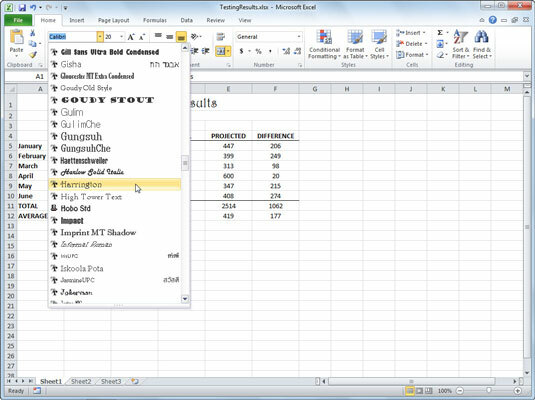 Excel 2010 includes several ways to format the fonts in your worksheets. You can change the font face, font size, and font color using the commands in the Font group on the Home tab. You can make additional font-related changes by using the Font tab in the Format Cells dialog box. To access these settings, click the Font dialog box launcher (that little icon in the lower-right corner of the Font group on the Home tab). On the Home tab, open the Font drop-down menu and select a font. As you hover your mouse over a font face, Excel’s Live Preview feature displays the selected cells in the different fonts. Use the Font drop-down list to choose another font face. In the Font group of the Home tab, click the Font Size arrow and select a font size. You can choose another size besides those listed by simply typing the desired font size in the Font Size box. If you want to quickly go up or down a font size, click the Increase Font Size or Decrease Font Size button in the Font group. In the Font group of the Home tab, click a button to apply a font attribute. The default underline style is a single underline. Click the Underline button down arrow to choose Double Underline. Or, choose additional underline options through the Font dialog box launcher, which displays the Format Cells dialog box. Underline options appear on the Font tab. In the Font group of the Home tab, click the Font Color drop-down arrow and select a color. 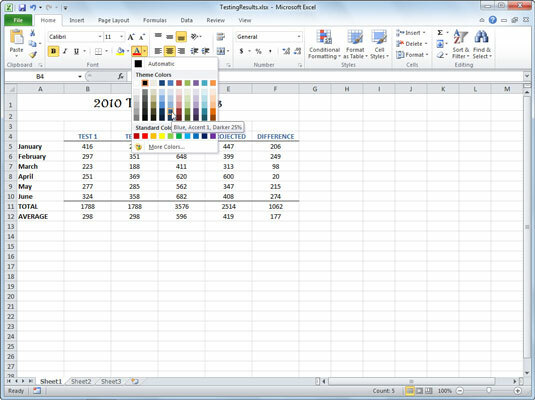 If you hover the mouse over a color, Excel’s Live Preview feature shows you the selected cells in that font color. Click More Colors to display the Colors dialog box from which you can select additional colors as well as create your own custom color. Spice up your worksheet by changing font colors.